Arrival in Keflavik airport. No issues except a grumpy old lady on the bus to hotel. Lots of grumpy old people. I’m beginning to wonder if I got on the bus to Shady Pines instead of the modern European hotel that I am expecting. Hopefully it’s not the prison bus either, but if it is I will so take on that lady on the inside. We arrived at 06:30 and it is now 08:23. My impression of Iceland so far… dark. Sunrise is supposed to be at 09:21, but for now black as midnight. There are a lot of people out on the roads going somewhere in the dark. Hopefully it’s not to the same hotel that I’m going to because, then we may have a problem. We arrived at the hotel and thank baby Jesus (or Thor? ), they let us check in. We dropped off our luggage in the room and came down to the restaurant for breakfast. After breakfast, we signed up for an afternoon tour and settled in for a few Zzzzzzs. Our “Golden Circle” tour had us load on a bus to see some of southern Iceland’s “natural phenomena.” About an hour outside of Reykjavik we came upon Þingvellir National Park (pronounced Thingvellir in English). Þingvellir contains Þingvallavatn, the largest natural lake in Iceland. As we drove by, we could see the fresh water springs bubbling up around the perimeter of the lake. The area is part of a fissure zone situated on the boundary of the North American and Eurasian tectonic plates. We were able to get off of the bus and explore the rock formations before moving on to the Gullfoss “Golden Falls” a bit further down the road. 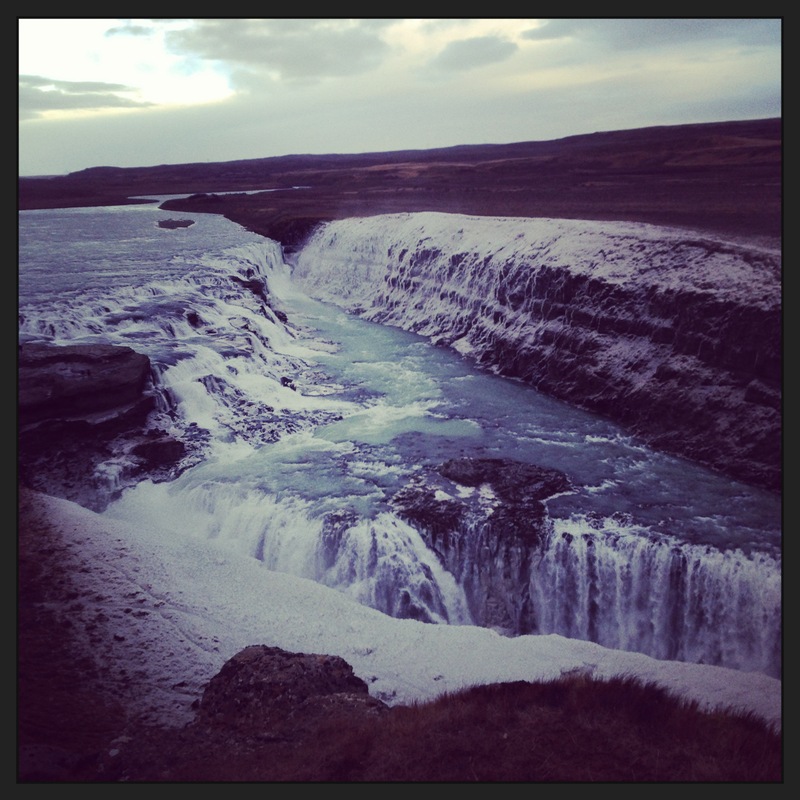 Gullfoss is a two tiered waterfall in the canyon formed by the Hvítá (meaning “white river”). I’m guessing it’s called that because it is a river made of ice. Brrr. As we stood to capture our selfies in front of the raging falls, we could feel the ice spray coating our faces. Double brrr. Next stop: the Geysir region. Geysir literally means “geyser” and is said to have been derived from the Old Norse word for “to gush.” Iceland was originally settled by the Vikings in the late 9th century and there are many things to remind you of that while exploring around Iceland. The largest of the geysers in this area is Geysir and reportedly because of earthquake activity in the area, it does not erupt as often as it once did. We were able to see the slightly smaller, Strokkur geyser (meaning to churn), spew it’s boiling “fart” water, rife with sulfurous mineral deposits, several times before hypothermia began to taunt us. Although the temperature gauge on the bus claimed that it was 8° Celsius (46°F) the wind was ripping and it was COLD. Once the sun finally came up, what I saw of Iceland looked a lot like Maui if you turned down the thermometer…waaaay down. More thoroughly, start with cold Maui, particularly the backside where they threaten to void your car rental contract, add in some Craters of the Moon National Park, a splash of Yellowstone (geysers) and a tiny dash of The Badlands National Park. The terrain is meandering with roads (sometimes single lane sometimes double) that crisscross around in no particular pattern and are devoid of any discernible traffic signs. The sun set at 4:52 chasing us back into the tour bus for the ride back into Reykjavik where we learned many interesting cultural tidbits from the knowledgeable guide. After returning to the hotel, Jeff and I hit our second wind and caught a cab into Old Town Reykjavik to have a “culinary tour” of Iceland at the Fish House Restaurant – Fiskmarkaðurinn. We had selections of dishes from different regions of Iceland, including salmon, cod, lamb and skyr, an Icelandic yogurt type food. It has been part of Icelandic cuisine for over one thousand years. I felt like we were the food tasters for Top Chef, as everything was so delicately put together and more than a few times we were saying, “What IS that! ?” And after referencing the menu saying “oh, OF COURSE that’s lobster foam” or “sorrel pesto” or “caramelized beetroot.” It was all delicious and Jeff was satisfied because I was finally forced into eating lamb. Baa. After a cab back to the hotel, we repacked our bags for an early morning flight to the second largest populated area in Iceland, the northern town of Akureyri, population 17,000.